With the KW Height Adjustable Spring (H.A.S.) kit you get the height adjustability of coilovers without the price tag. Your car will ride well and look great without breaking the bank. Race technology for the road: the same technology that goes into KW's race suspension goes into their suspension tuning. Full height adjustability lets you get rid of that ugly wheel gap. Uses factory shocks so you don't have to give up your adjustable suspension. Enthusiasts love coilovers. Having a complete system that pairs a matching damper with springs and has height adjustability is fantastic. However, sometimes a complete coilover kit is out of the question but you still want that height adjustability. The KW H.A.S. kit is the perfect solution. 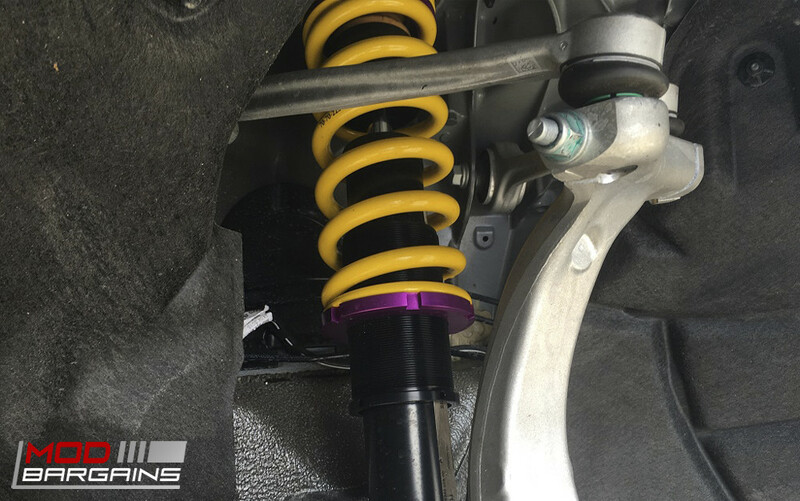 For less than half the cost of their coilover kits you can get a completely height adjustable set of springs that are designed to harmonize with your factory dampers, either EDC or standard. Having full height adjustability and potentially saving enough money to buy a nice set of wheels doesn't sound too bad does it?